Angharad Stockwell, Scottish Canals’ Records Manager and Data Protection Officer, shares her blog as this year’s Remembrance Day marks 100 years since the end of World War One. Earlier this year an interesting object appeared on my desk – a rough wooden signboard, about a meter in length with hand painted text. 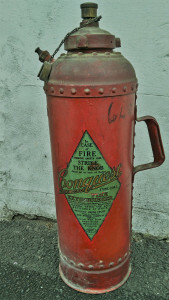 c.1930’s fire extinguisher made by The Pyrene Company Ltd. The signboard, along with a few other items of interest including a 1930s fire extinguisher, had been gathering dust in the basement of our Crinan Canal office in Ardrishaig for many years. The quieter winter season offered an ideal opportunity for a clear out, which is how these enigmatic items were discovered and brought down to Glasgow for further study. The wooden board immediately caught my attention. Who was Commander Venables and why does his name appear on the signboard in our office basement? The chance to do some sleuthing was too good an opportunity to be missed, so I set to work trying to find out a bit more about the mystery navy man. Comdr. (E) G.H. Venables. R.N. Apart from the name and address, the meaning of the text and as such the purpose of the signboard was not immediately obvious. That was until a connection between the signboard and the former steamer passenger terminal at Pier Square, Ardrishaig, was proposed. 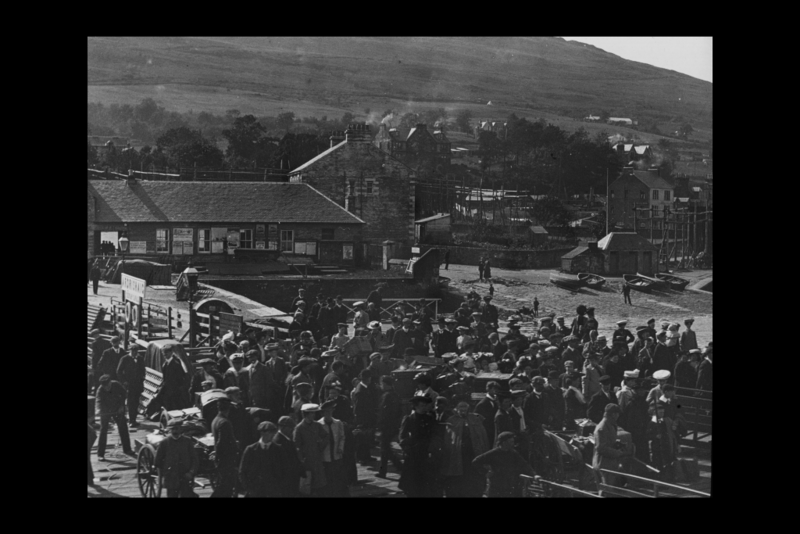 The former passenger terminal building at Ardrishaig (now The Steamer Terminal café and stores) was built in the late 19th century to administer large numbers of passengers and freight that travelled through the port on a daily basis. By the mid-1800s, over 30,000 passengers were travelling along the Crinan Canal each year, most of whom would have arrived or continued on their journey via Ardrishaig port as a popular stopping off point for the Clyde steamer services from Glasgow. Perhaps the signboard was affixed to cargo belonging to Commander Venables, and was later discarded when the cargo left the quay. It certainly seemed likely given Ardrishaig’s history as a busy port. But what of the man himself? According to the signboard, Commander Venables was a local Argyll man based in Kirn, a small village on the east side of the Cowal Peninsula. 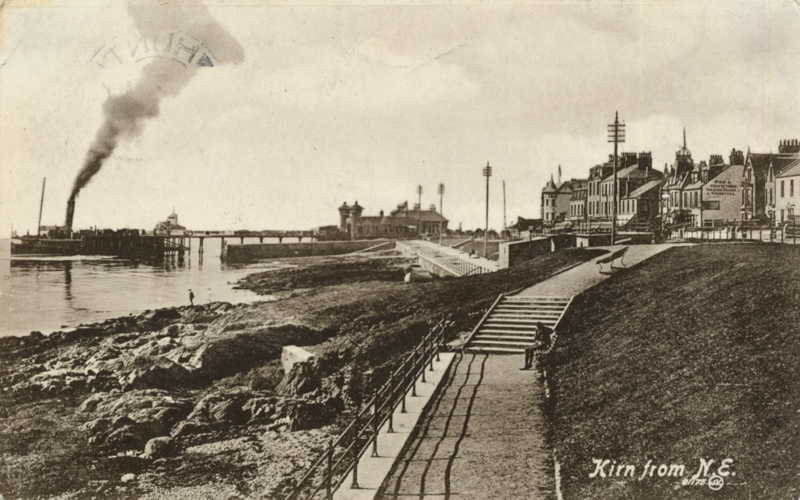 Kirn was also once a stop on the Clyde steamer services from Glasgow; passengers would alight at Kirn pier (sadly now demolished). A quick look at historic mapping on National Library of Scotland’s maps online resource revealed that Shuna Lodge still exists today, forming part of a row of houses on Ardenslate Road. The signboard also tells us that Commander Venables was a Royal Navy officer (R.N. ), but unfortunately does not tell us when. Given that the lettering on the signboard appeared to be of some age, I hazarded a guess that Commander Venables served with the Royal Navy during either the First or Second World Wars. A search of the digitised Navy Lists (lists of officers who served with the Royal Navy during the First and Second World Wars) confirmed my hunch to be correct. Commander Gilbert Henry (G.H.) Venables appears in a number of the lists from 1939 to 1944, assigned to the war ships HMS Maori, HMS Suffolk, and HMS Bonaventure. HMS Suffolk sustained severe damage during the Norwegian Campaign of 1940, having to retreat to Scapa Flow in the Orkney Islands before returning to the Clyde ship port for repairs, where she stayed until February 1941. Commander Venables was awarded the Distinguished Service Order (DSO) for his part in the Norwegian Campaign, specifically ‘…for gallantry and devotion to duty when engaged with enemy aircraft off the Coast of Norway’ as announced in a supplement to The London Gazette 4 October 1940. Commander Venables was subsequently awarded the Order of the British Empire (Military Division), also announced in a supplement to the The London Gazette 1 January 1946. Famously, both HMS Maori and HMS Suffolk participated in the pursuit and destruction of the German battleship Bismarck in 1941. However, it is Commander Venables’ connection with HMS Bonaventure that yielded the most tantalising evidence yet – a photograph of the man himself! A search of the online catalogue of the Imperial War Museum turned up a series of photographs from the official Admiralty collection on the theme of midget submarines. HMS Bonaventure started out her life as a civilian steamship, laid down at Greenock by Greenock & Grangemouth Dockyard Company, but shortly after the outbreak of the Second World War was requisitioned by the Royal Navy and converted to use as a submarine depot ship. From January 1943 up until her departure to the Pacific in January 1945, the ship was the main training base for the X-craft and XE-class midget submarines based at Loch Striven on the Cowal Peninsula coast. 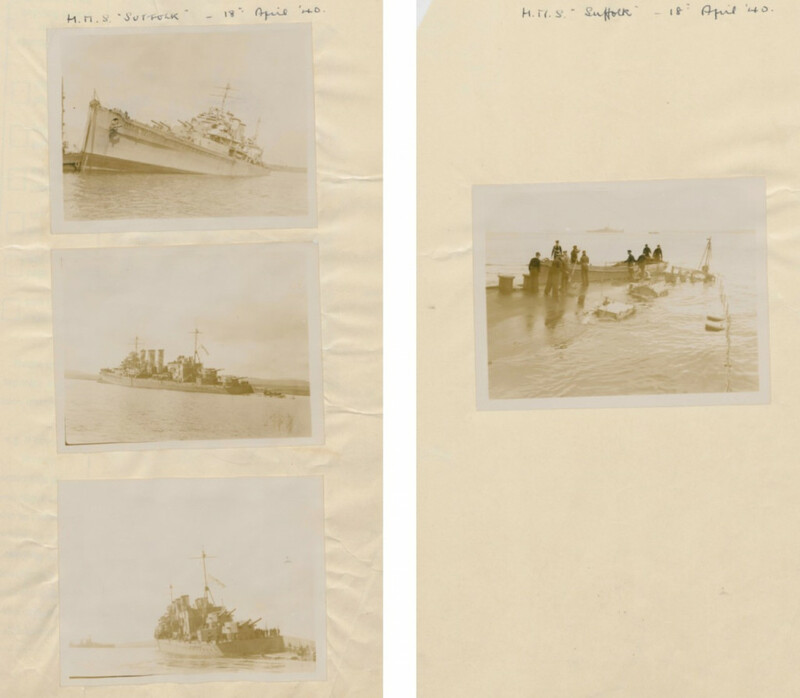 The photos from the Admiralty collection below were taken aboard the HMS Bonaventure sometime during this two-year period when she was stationed at the sea loch. Midget submarines frequently used the Scottish canal network during wartime and in the immediate post-war period as a convenient coast-to-coast route. The photographs below show midget submarines on the Forth and Clyde Canal travelling from the Clyde on the west coast to Grangemouth on the east sometime in the early 1950s. RIGHT – Midget submarine Shrimp at Knightswood ©The Scotsman Publications Ltd. Unfortunately, I was not able to find any more information about Commander Venables in the public record. Military service records held by The National Archives are only available to view up to 1924. Records after this date remain closed to protect the privacy of living persons. Nevertheless, the discovery of the signboard and the story it revealed provided a fascinating insight into the life of a distinguished naval officer and the canals during wartime.